Mammal - Vertebrate - Insectivore - Carnivore - depending upon the species. There are 1,300 different species of bats. They are the only mammal that can fly. Can be as large as a small dog, or as small as a bee. 70% of bats are insectivores, eating mainly insects. Can eat up to 1,000 insects in an hour. Eat a wide variety of food items - fruit, nectar and pollen, insects, frogs, fish, small mammals and blood. Vampire Bats feed on blood. Live in every continent in the world, except Antarctica. They prefer warm climates. Most live in forests. Some species like to live in dark places, such as caves and attics. Vampire bats can carry rabies, making their bile potentially dangerous. Have an excellent sense of smell. Female bats give birth while hanging upside down. They catch the baby in their wings as it drops. Female bats can find their babies among thousands or millions of other bats by their unique voices and scents. Baby brown bats cling to their parents as they fly. Babies weigh as much as penny at birth. Can detect warmth of an animal from about 16cm away. In the wild, they can live for over 20 years. When winter comes, some migrate to warmer climates. Always turn left when exiting a cave. 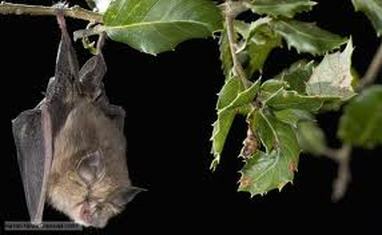 Big brown bats can make it through the winter without feeding, but they do need to wake up to drink. Their heart rate drops from 1,000 beats per minute to 25 beats per minute - taking one breath every two hours. The Tube-Nosed bat lives in the rain forests of the Philippines and is highly endangered. A Pipistrelle bat weighs less than a 2p coin. The world's smallest mammal is the Bumblebee Bat of Thailand. There are 690 known species of bats. When in flight, a bat's heart beats 1,000 times a minute. Bat droppings, known as guano, are one of the richest fertilisers. Singing plays an important role in a bat's social life. In America, bats eating pest insects, save the agricultural industry an estimated $3 billion per annum. Vampire Bats share their food with their friends. The bat is a symbol of happiness and joy for the Chinese.